Hundreds of Palestinian flags were flown on the main floor of Labour’s Party conference yesterday despite the British flag not being allowed. The flags, which were flown with approval of the Labour leadership, were handed out to delegates by activists before the Conference passed a motion demanding a freeze on arms sales to Israel and an investigation into the deaths of Palestinians on the Gaza border. Shockingly, earlier in the week Labour constituencies chose to debate “Palestine” with more than 188,000 votes – making it the only international issue to receive a dedicated debate in Liverpool and thousands more votes than for concerns such as the NHS, the welfare system, or Brexit. Delegates chanted “Free Palestine” as a motion condemning the Israeli response to protests in the Gaza Strip was moved by Colin Monehen from Harlow CLP, who said security would need to remove him from the stage after his speech ran overtime. The debate and motion – that was unanimously carried by a show of hands – focused heavily on the Great Return March this summer. On the deadliest day, terrorist group Hamas admitted that 50 of 60 killed were its members. No speaker referred to the exploitation and incitement led by Hamas. The text, put forward by Harlow CLP, demanded an independent international investigation into the “use of force against Palestinian demonstrators”, a freeze on UK arms sales to Israel and an end to the “blockade and closure” of Gaza. Mr Monehen’s motion was then seconded by Zahid Ali, whose speech calling for an end to the blockade of Gaza and arms sales to Israel, was again greeted with chants of: “Free! Free! Palestine,” and “From the river to the sea, Palestine will be free,” as leader Jeremy Corbyn looked on from a seat on the platform. Paul Wilkinson, of Gedling Labour Party, briefly took to the stage to say he had been prevented by the stewards from waving an EU flag in the conference hall earlier, accusing organisers of “double standards”. The conference also condemned the US decision to cut funding to the UN agency for Palestinian refugees (UNRWA), describing the move as an “aggressive attempt to rewrite history, and erase the victims of the 1948 war, who were expelled or fled from their homes in Palestine”. Conference members urged the Government to increase aid to UNRWA and to encourage other member states to do the same. The UK announced in September that it will give an extra £7m to UNRWA, to compensate for US cuts, increasing its funding so far this year from £28.5m to £45.5m. In 2017 the UK donated £67m to the UN agency. Speaking at a Labour Friends of Palestine event at the conference on Monday, party leader Jeremy Corbyn said a Labour government would recognise a “state of Palestine” as soon as it is elected. Shadow Foreign Secretary Emily Thornberry told the conference: “I stand here with no hesitation when I condemn the Netanyahu government for its racist policies and its criminal actions against the Palestinian people.” She added: “But I know as well, and we must all acknowledge, that there are sickening individuals on the fringes of our movement, who use our legitimate support for Palestine as a cloak and a cover for their despicable hatred of Jewish people, and their desire to see Israel destroyed”. 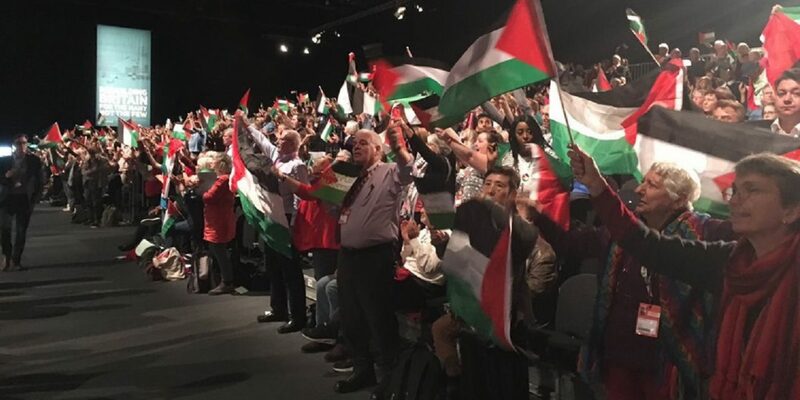 This is the British Labour Party conference earlier today under Jeremy Corbyn.The Palestinian flag is seen all over, not one Union British flag in sight.